In book 6 of the Colony Ship Trailblazer series, Janae and her friends on the wrecked colony ship are trying to unravel the mysterious machine called the Gadget. Just what can it do? Is time travel actually possible? Are alternate realities truly a possible destination? How will one identify a subtly different reality from the original one? Is that even possible? And if someone does alter the past, what ripples will appear in the present? Time, space, and reality are investigated, but will there be answers or just more uncertainties? Additionally, enemies on the Trailblazer are seeking conquest and a vendetta against Janae and her allies. Will friends shift allegiances? The tactics the enemy is using are brutal and effective. Can Janae, Kimberly, Ape, and Kenneth find a tactical solution, or will events unfold and fate take them where they do not want to be? Just what tactics will work, and what ones will prove to be terminally wrong? 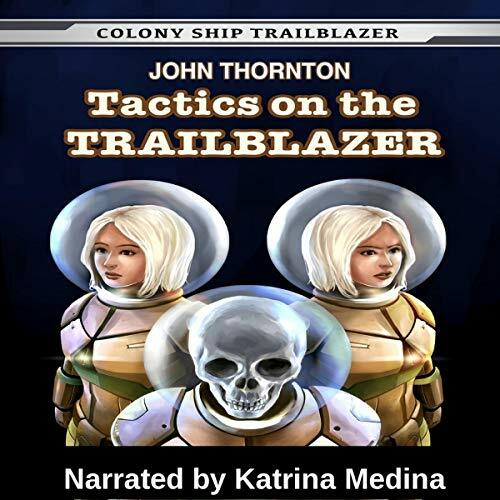 Tactics on the Trailblazer Colony Ship Trailblazer, Book 6. Another great story in the series (though I would normally close a book at the hint of time travel), the series is so strong I listened to the end and am pleasantly surprised. Totally surprised at the ending, and can't wait for the next in the series.